A Cardboard Problem: What a game! All I have to say is, WOW! 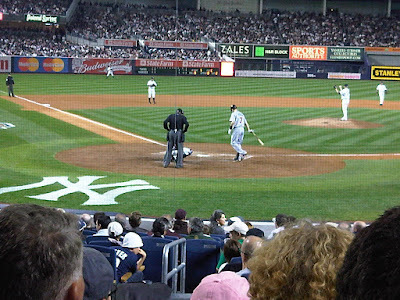 Sooz and myself, along with my brother and his friend had seats 15 rows behind homeplate last night for Game 2 of the ALDS, Yankees v. Twins. 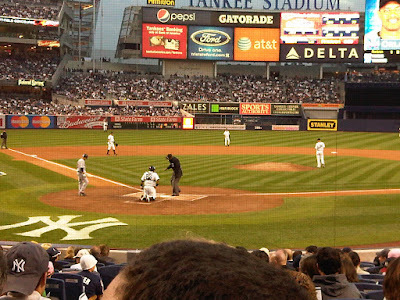 The seats were insane, most of the people were either bored or had no idea what was going on next to us, but we had fun and the Yankees came out victorious. 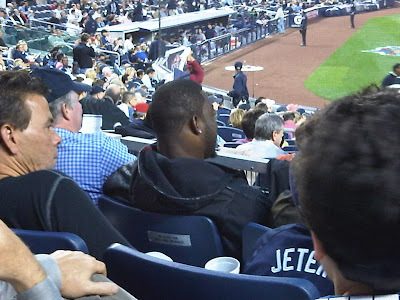 I know we had good seats for 2 reasons, the first being we were 15 rows from the field, and the second being we were only 2 rows behind Justin Tuck of the New York Giants. 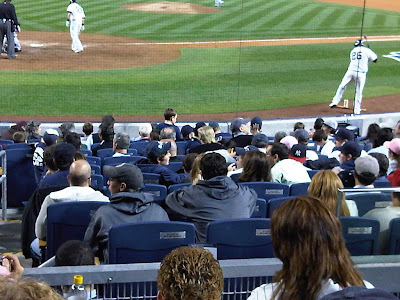 And if we needed a 3rd reason, Donald Trump was about 8 rows in front of us in the moat seats. You can't miss that rug on his head. The game was great. 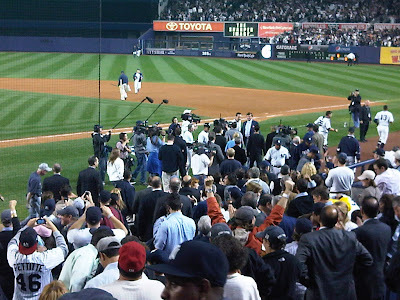 A-Rod showed up and proved he can play in the post-season, and I guess it's better late than never. It also could be because he missed a month and maybe thinks it's still September (just ask Flash). 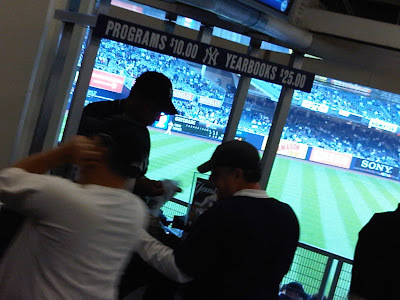 A-Rod tied the game with a blast, which I don't have a picture of because I was too busy going bananas (B A N A N A S). 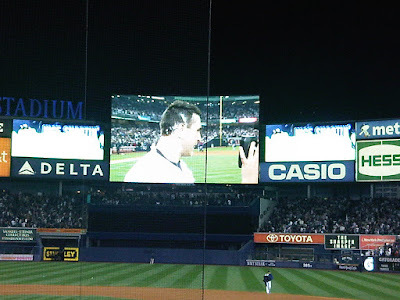 Then Teixeira came up in the bottom of the 11th and smashed a line drive that hit the top of the wall for a game winning homerun. I am not going to get into the umpires sucking because I don't care anymore. Ronan Tynan singing God Bless America. I took some pictures and I figured some of you guys might like to see a different view. We stayed long enough to see the pie and I got a few pics of that, too. 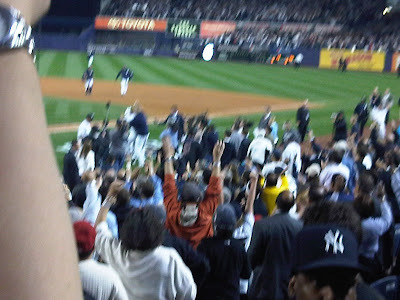 The whole stadium stayed for the pie and most of the people were singing 'New York, New York' very loudly. The first picture was blurry because AJ was running out and I was screaming and couldn't stay still. 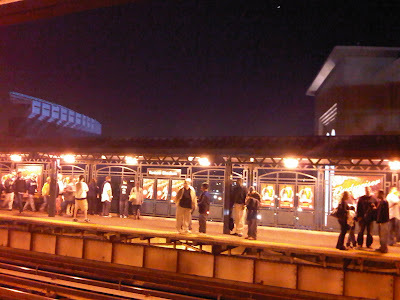 The view from the platform of the 4 train, right in between the old (left) and new stadium (right). Wow I watched that game on TV last night. An instant classic is the cliche. Great seats - did Tuck and Trump make it till the end. 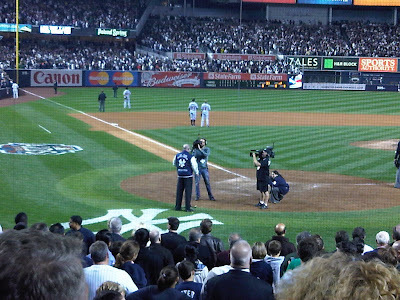 I remember knowing I had good seats at Fenway once when I saw Steven King about 8 rows behind me. Nothing like a playoff walk-off, is there? 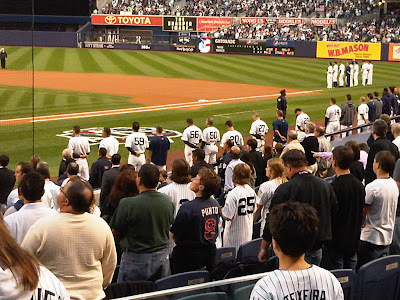 I remember the feeling I had in the stands at game 4 of the 2004 ALCS. Absolutely incredible.